There are few times when one can say a sequel surpasses the greatness of the original film - The Empire Strikes Back, The Godfather Part 2, and Captain America: Winter Soldier are just a few examples. 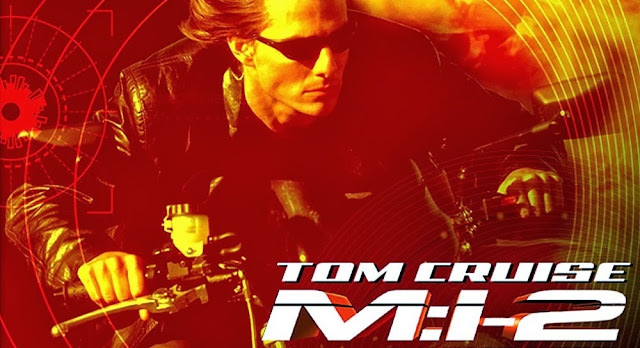 And I can say, without a shadow of a doubt, that Mission: Impossible 2… is NOT one of those films. After such a good film, one that has remained in the pop culture zeitgeist, it is mind-boggling that this was what came next. When I decided to do these reviews before watching the latest installment of this franchise, I noticed a lot of other critics doing the same. And with that, I saw an overwhelming number of bad scores for this film and couldn’t understand why. I remembered it as a good, fun action flick, and at times it was fun, but it became glaringly obvious that my ability to critically look at films has grown in the decade since I last saw this film. The sequel to the 1996 film was directed by 90’s action icon John Woo (Face/Off, Broken Arrow, Hard Target), and it’s clear from the opening scene that this installment would be much more action oriented, with less focus on the espionage of the first, however it did include a mask reveal, just like the first. And this wasn’t the only callback to the first film, as later on we saw Woo’s version of the famous wire scene, which was nowhere near as intense, and the up close blade shot on Ethan. It is very clear that this is a John Woo film, as the whole thing is so over the top, with tons of explosions and classic John Woo staples such as slo-mo action sequences, lots of wind, double guns, and flying doves. And Woo must’ve really loved the mask trick from the first film as he reused it 6 or 7 times here. This film is mostly just flash with very little substance, which is a huge departure from what made the first film so great. Right away you can see that this is a different Ethan Hunt from what we saw before. He grew out his hair, has a completely different fighting style, and is much more carefree and less high strung. It’s a smoother, more debonair Ethan, and it’s clear that Woo is trying to make his own version of a James Bond film, complete with a “Bond girl” in Thandie Newton’s Nyah Hall. The over-sexualization of her character is just one of the many instances of blatant misogyny running rampant throughout this film, which is something you tend to find in a Bond flick. However, Newton’s character is one of the few bright spots here and should definitely return in a future installment. I was actually reading that she opted out of appearing in part 3 to focus on her family, but if she had returned in the third film, she would’ve become a highly-trained agent for the IMF and part of the team in 2006. That is something I would have loved to have seen. Now, I’m not going to say that this was a completely garbage film, because it wasn’t. It had some redeeming qualities, but the negatives definitely outweighed the positives. The rock climbing scene at the beginning was cool, and seeing the upgraded tech was nice because at least that part of the film didn’t feel dated like it did in the first, it was just the rest of the film that felt dated, and Thandie Newton, of course. Right away you know this will be a totally different tone from the first as, like I said, it skews more toward the side of action with only shades of the heist film we loved from the original. With a weak script (“This isn’t Mission: Difficult, it’s Mission: Impossible” is such a bad line of dialogue), subpar score, and too many clichéd moments to count, this is absolutely the weakest film in the franchise, and isn’t one that I’ll go back to when I need my Mission: Impossible fix.